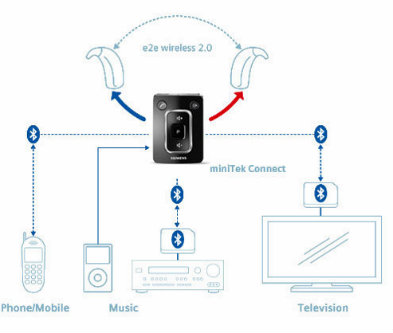 Bluetooth technology provides wireless transfer of information and is the system your laptop computer, tablet or any other wireless device uses to connect to a wireless internet connection. This system is now available in hearing devices and allows a multitude of possibilities. Remote Control – allows easy adjustment of volume or listening programs. Connection to Cellphones – sound from your phone is played loud and clear into both ears, hands free. Connection to Landline Phone – alerts you to the phone ringing and allows you to answer up to 10m away. Connection to Audio Devices – use your Hearing Devices as stereo headphones for ease and comfort. Connection to TV – watch your favourite shows without the sound of the TV bothering anyone else in the house. Connection to Computers – allows clear, stereo sound from your computer with no wires. Most of the Hearing Devices fitted by Hear Again now feature wireless connectivity capabilities, with the accessories available for purchase separately. You can be provided with them when you have your new Hearing Devices fitted, or add them at a later stage.